I'm being flooded with e-mails from members who have not been able to get a new password for the forum. 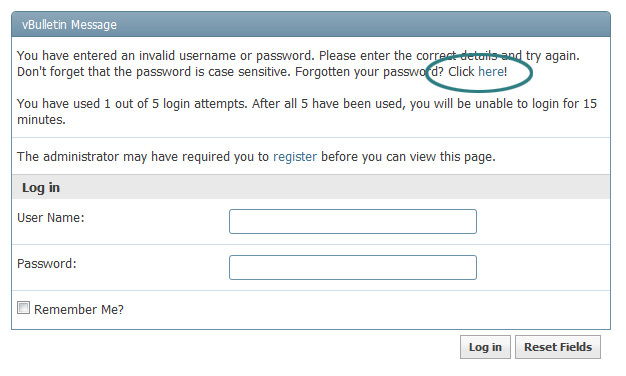 Some people can't see how to request a new password and some aren't receiving the e-mail with their new password. e-mails have been queued because of the number of password requests but they should all have been sent now. If you didn't receive an e-mail, it could be because the e-mail address in your profile is not the e-mail address you are currently using. It may not work from mobile devices and a few members have reported that the password e-mail went straight into their spam folder so please check yoiur spam. Eddie, the other problem many will have (and this happened to me, too) is that often the email containing your new password goes to your spam folder for some reason. Anyone who doesn't instantly receive an email with their new password should have a look in their spam folder because it's probably sitting in there. This is exactly what happened to me so it's well worth checking your spam folder. And me, but the spam folder on my iPhone didn't show any emails I had to log on to Gmail to see them. Yip - just checked and mine had gone into spam, despite the original email with the link to verify my account coming through OK.. go figure! I'm using Yahoo Mail and it got right where it was supposed to (not in Spam folder). I guess that GMail is to blame here. Yes, that's what seems to happen and what's confusing. First email with link arrives to inbox, second email with password straight to spam. Same with SKY as well!! In now so thats good!!! Thanks for the tip Eddie!! Thanks a lot, everything working again! Great to be back on-line ! Non of the emails for the password reset went to my spam folder, they correctly arrived in my inbox and I'm using gmail. Odd how it's affecting some and not others. Check your webmail chaps! Computer-based e-mail clients seem to have a knack of not showing the password reminder mail. Mine worked fine, email to inbox. But why the hell did we loose our passwords in the first place??? You obviously didn't read the announcement I made on the old forum well in advance of the migration. Passwords are encrypted and cannot be exported. If you don't like the inconvenience, go somewhere else, I've spent more than 40 hours trying to make this work and my hosting service has matched this. If you don't like it, ask for a refund - oh, I forgot, it's FREE! My current active email is gmail. My old email that I registered to TZ is blueyonder. One forwards to the other. The problem was that the blueyonder email catches spam and doesn't notify gmail email, that is where my password was hiding. But I did post an announcement on the old forum back in June asking for people to make sure their e-mail address was current. I tried to ensure that the migration was as trouble-free as possible but the 173 e-mails I've responded to so far today suggests that it's a waste of time expecting people to take any responsibility for not being able to login. I'm not bothered, I'll just delete those who don't make it. Gmail puts the new password mail in the spam folder, if there is anyone out there with gmail reading this. Had to get into the spam folder via Virgin mail to get my password details,didn't come through on Windows Mail. I had the same problems with the password and just as I was writing Eddie an e-mail I looked again for the "forgotten password" button. Checked the spam folder and here I am. I thought my account was removed for some reason at first. I added my current email a few months ago after Eddie put the sticky up, yet still was too thick to look for "reset password" till the Congratulations you ARE a man, and yes you have exhausted all 5 goes you idiot window came up (!) reset the password, looked in the junk folder when it don't show up, then accidentally deleted it (proof of male chromozone again) extracted it from trash can and let myself in, then gave myself a new password. I think. Sorry Eddie! However you have done a sterling job on the transfer, being a far braver man than me, so three cheers from the Thames estuary. As way of thanks please find the virtual bacon sarnie enclosed. I did take heed of your announcement, checked that I got email from the forum and left well alone. The purpose of my post was information to read only non-logged in old members and in no way criticism. ... Click! And we're back in the room! Phew, I´m back in! Thought I would have to re-register as the address from which I was trying to reset the password wasn´t recognised, Eddie sorted it though. Nice to be back. After prompting from this thread I found my new password in the spam folder (didn't know there was such a thing) computers can be very mysterious to me. I'm back at last. I use Gmail and, as someone has pointed out, while the first reset e-mail is received the second one (with your new password) goes into Gmail's spam folder. The only way of retrieving this is by accessing Gmail through your web browser and finding the spam folder - it won't be in your computer's e-mail (eg Outlook's) spam folder. I guess I was deadshit number 174 - but it's all fixed now, thanks Eddie. Same problem here with the second email going to SPAM in Gmail, all good now, thanks for the migration, looks like we have RSS feeds now, let's give it a try! I use crappy old AOL, no problems at all here! I was getting the first bit to my email but no password after that. What happened to me as well. Must admit this is the first time I have noticed gmail spam filter blocking things from Outlook, but having looked there I see a few other bits n bobs. Definitely need to remember this! I haven't been on here for a while and must have missed the announcements, either through absence or blindness/stupidity. Sorry for bothering you for what seems to have been the umpteenth time Eddie. Sorry Eddie, my bad. I simply did not see the announcement. No inconvenience for me the since password recovery exactly as advertised: email to inbox. I've had more than 300 e-mails from members who couldn't get a new password; most of them didn't even try, just said they couldn't login. At an average of 2 minutes per e-mail to read and reply you can work out how much time I've wasted. All worked fine for me and I am not very technically literate. When I did not receive the new password email I assumed it was in the Gmail spam folder and there it was. The new functionality on the forum looks amazing if a little bit overwhelming initially. I am looking forward to getting to grips with all the features. Fantastic to be able to search properly as well. Also it might be worth pointing out that most members PM in box is full since the site changeover.....so perhaps a post (if there isn't one already?) to ask all members to check/read/clear their in boxes?? Thank you Gareth, I have just cleared mine out. Just a quick note to those (if there are any) as thick as me in getting the new password. I thought the spam folder was the Norton one on my Outlook, and I was struggling to understand there was actually another one provided by NTL, my ISP. I had to log onto my mail on the NTL site, and retrieve my new password from the spam folder there. I'm not a techy type you see !! but got there in the end. Eddie, if you read this, thanks for your help. As a user of Entourage I didn't even know that Virgin Mail was operating in the background on my Mac. It took me days to begin to understand where the mysterious password mail had actually gone. Apologies to Eddie here for driving him mad with mails. Anyway, I saw a thread on another site and found VMail with 7000 old mails in it. Even finding the spam folder was made as difficult as possible but when I found it, there were all the TZ passwords and here I am. You learn something every day it seems. Bloody VMail. Who knew? See my post above. Same happened to me. worked for me, thanks Eddie! Thanks for helping me getting back in. Me too. It took a while but I am back! I maffed this big time ,missed Eddies messages my fault Eddies gives a hell of a lot of time free and i appreciate it . Why didn't you resurrect your own account? All it takes it to change the e-mail to your present one and force a password reminder. I thought I'd already done this? I would rather you revive your old account than create a new one.